War is the application of violence against an enemy for political ends. It’s a brutal business, but in the midst of the killing and destruction men can act with honor, decency, even altruism. In fact, we demand it from our professional soldiers and are disappointed when the brutality of war leads them to become brutes themselves. As western Europe crumbled before Germany’s blitzkrieg in the opening months of WWII, it became clear that Allied armies would have to invade Europe to liberate it. Loosening the Nazis’ grip would mean raining down frightening quantities of high explosives on cities, and unleashing tens of thousands of heavily-armed soldiers in the countryside. The fighting would begin in Italy and France, in places containing some of the world’s most revered artistic, historic and architectural treasures. President Franklin D Roosevelt was a patron of the arts; the last thing he wanted was to win the war while destroying Europe’s cultural heritage. Because of FDR’s concerns, the American military began recruiting a small corps of architects, sculptors, art restorers and museum curators to work alongside the advancing armies. Known as the Monuments, Fine Arts and Archives commission, or MFAA, these soldiers were to enlist the help of military commanders, soldiers and civilians to protect Europe’s historical and cultural treasures from harm. To give their mission some teeth, General Dwight Eisenhower issued an order making it “the responsibility of every commander to protect and respect” all historical monuments and cultural centers that lay in the path of the invasion, unless their destruction was found to be a matter of “military necessity.” Prior to the invasion, the Monuments Men, as the MFAA soldiers became known, plotted the location of hundreds of cultural heritage sites in order to make local commanders aware of the treasures that would be in the path of the battle. As soon as Allied forces secured an area, Monuments Men moved in to evaluate the condition of cathedrals, libraries, historic ruins and the like, recruiting civilians to prevent further damage. 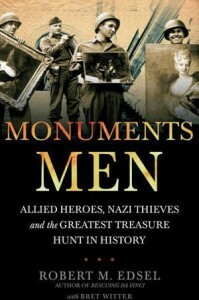 The story of this unprecedented humanitarian effort has been told by Robert M Edsel in his 2009 book Monuments Men: Allied Heroes, Nazi Thieves, and the Greatest Treasure Hunt in History. The Allies sought to protect Europe’s cultural treasures in situ, but Adolf Hitler saw Europe’s artistic treasures as a means to political legitimacy. As part of his vision for the Third Reich, Hitler planned to build a great art museum at Linz, Austria, his adopted home. The Fuhrer was an aficionado of the arts, and the conquest of Europe gave him an opportunity to acquire a world class collection. As Hitler’s armies swept across Europe, a special unit of the German SS stripped towns and cities of their artistic treasures and shipped them back to Germany by the trainload. The Nazis had made it illegal for Jews to own art, which provided legal cover for the confiscation of any valuables owned by Jewish families. The smaller museums in conquered countries were emptied, others were permitted to keep their collections — with the understanding that they would now be owned and managed by the Third Reich. The only thing the Nazis didn’t confiscate was the so-called “degenerate” art of the modernists — those pieces they burned. Fast forward to the liberation of France. The Allies were closing in on Germany, and the big question for the Monuments Men was, Where had all the art gone? The SS art collection operation was highly secret, and the Nazis had hidden their loot in dozens of heavily guarded locations in Germany and Austria — for instance in Reichsmarshall Herman Göring’s homes and in Hitler’s Eagle’s Nest chalet in Berchtesgaden. But most of it was underground, buried in fields, crammed into bomb shelters, hidden in mines. One of the largest collections was found packed into miles of dark tunnels in the famous Altaussee, Austria, salt mine. Monuments Men Robert Posey and Lincoln Kerstein were the first to discover its secrets on May 16, 1945. When the Americans completed the Altaussee inventory less than a month later, the tally for this one repository was 6577 paintings, 230 drawings or watercolors, 137 pieces of sculpture, plus historical artifacts, books, tapestries, furniture, and much more. When Germany surrendered, the MFAA continued its work, cataloging and repatriating the stolen art to its rightful owners. Of course, the owners of much Jewish-owned art had been murdered in the concentration camps. Hundreds of thousands of other items remain missing to this day. Some were undoubtedly destroyed, some were buried and never found. A great many were illicitly placed in private collections and given forged provenances. For the most part, though, the rich artistic and cultural heritage of Europe was restored to its pre-war glory, thanks to the Monuments Men. I think the commitment of Roosevelt and Eisenhower to protect Europe’s cultural riches, and the efforts on the ground to fight a war while honoring those commitments, shows us something interesting about human nature. We can be in the midst of the most gut-wrenching events and still find the power within us to act honorably, altruistically, nobly. It is why the military does not excuse atrocities committed by its soldiers, or law enforcement by its officers. It is why we fight our political battles with words and ballots, and strive to treat our political opponents decently and with respect. The Monuments Men were part of an American military effort to restore and heal what the Nazis had tried to steal and destroy. The world is savaged by sin, and yet, we are able to rise above that savagery and act redemptively, when we want to. That’s the challenging legacy left by the Monuments Men. For more information, take a look at the website Robert Edsel has created to tell the story of the Monuments Men. Thank you for the detailed review of a fascinating book. I had not heard of it and now I’m eager to read it.